I made the choice to wear the hijab in the seventh grade. Making the decision was much easier for me than others given the community I grew up in; I attended Islamic school in New Jersey all the way through high school. I wore the hijab as part of my uniform starting in the fifth grade. My mother, most of my aunts and older cousins also wore hijab, so making the decision was not a leap for me. In fact, as a young girl, I looked up to all the women in my life who wore the hijab. But let's take a couple steps back, what does hijab even mean? Hijab is the transliteration of the Arabic word meaning a veil or covering. As an Islamic lifestyle concept, hijab refers to the way in which Muslims carry themselves modestly in both outward appearance and mannerisms. It also applies to both men and women. Like many other women of faith who choose to dress modestly, donning the hijab is a choice Muslim women make to please and obey God, and to identify themselves as Muslims. Wearing hijab in post-9/11 America is not easy, but what we struggle with in terms of judgement, stares, piercing remarks and the threat of having our scarves yanked off, we gain in sisterhood and strength. I could go on about hijab, my experiences and the diverse ways Muslim women wear their hijab for ages, but that is not what you are here for. 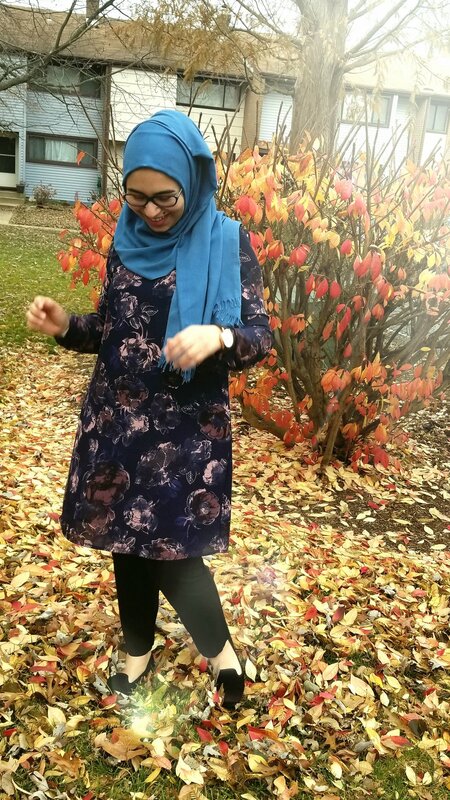 If you would like to read more about that, though, this piece from MuslimGirl.com does a great job of articulating some of the nuances of the hijabi experience in America. Dressing to observe hijab for me means loose clothing that covers everything except for my face, hands, and feet. It’s very similar to the way that Orthodox Jewish women cover, in fact, aside from the color restrictions. This can be a challenging dress code to abide by in a world of mini skirts, jeggings, cold-shoulder sweaters, for example. For most of my teen years, I didn’t have any public figures to look to for hijabi fashion inspiration or advice. My peers and I learned to layer and get creative when piecing together outfits that worked for our needs. It wasn’t always pretty, though. Social media, the internet and online hijab shops have long since changed that. The rise of social media influencers has played a huge role in modest clothing coming back into fashion on worldwide runways. Figures like Halima Aden, Dina Tokio and Dian Pelangi have led the charge in showing the world that faith and fashion are not mutually exclusive, while also proving to young Muslim girls that their religious choices should not put a damper on their creativity and style. This has also been made much easier by the exponential growth in online hijab shops such as Modanisa, Haute Hijab, Verona, Louella (by Olympian sabre fencer Ibtihaj Muhammad) over the past decade. As a designer, most of my professional experience has been in environments with a relatively lax dress code. I personally prioritize comfort when shopping or putting together an outfit. I don't want to be worrying about whether my scarf is in place correctly or whether the safety pin I used to drape my scarf over a low cut top is doing its job or not. This usually translates to basic pieces that are versatile and often in a similar cut. Straight leg pants with a long sleeved A-line dress is a basic go-to outfit for me, and you will see variations below. Monday: LOFT black skinny jeans, Old Navy sleeveless charcoal trapeze dress, Modanisa light gray comfy sweater, H&M dark grey scarf. Tuesday: Black Costco slacks, navy and pink floral long-sleeved dress from T.J. Maxx, teal scarf from a local Arab store in Philly. Business casual/formal. I often throw a dusty pale pink blazer over it for more formal occasions. I wore this outfit to an interview for a fellowship and when I was interviewing congressional staffers. Again, the A-line dress and straight leg pant formula. Wednesday: Louella cover up maxi cardigan, long-sleeved black dress , Gap skinny jeans, Modanisa eggplant-colored scarf. 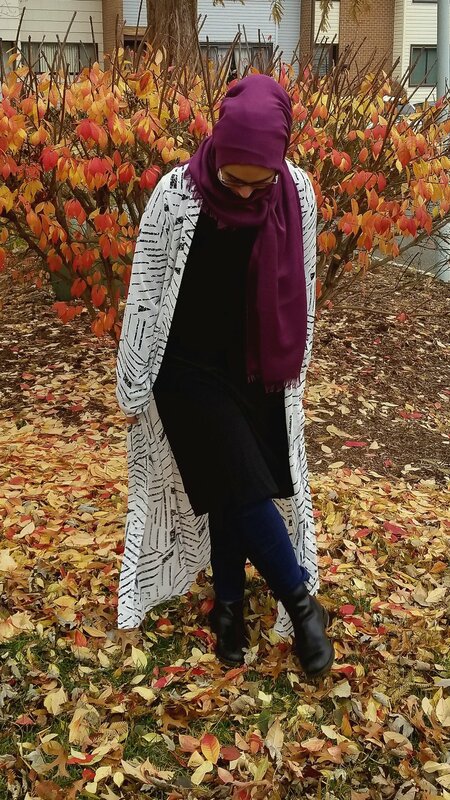 Long maxi cardigans go a long way in adding coverage to an outfit that may be more tight fitting than I am comfortable with, as well as adding interest and color to an otherwise boring (probably mostly black) outfit. Plus you look like a wizard when you power walk through the halls at work.I have multiple variations of this basic combo in my closet. It’s a pretty foolproof formula. Thursday: J. Jill straight leg jeans, Old Navy patterned dress with long-sleeved black dress underneath, teal scarf from East Essence. Synthesis days. Comfort is key since all my energy will be focused on organizing a lot of information within a new mental framework. Synthesis camp can be exhausting and I don’t want my outfit to be a distraction. Friday: Black Costco straight leg slacks, H&M dusty pink dress, Bulbul Scarves tropical leaves scarf. Meetings and internal presentations. I like to dress up on Fridays, and I love this color combo so it’s one I go back to often. A simple necklace does a lot to elevate this outfit to be a bit more formal as well. Great for days where I am going to an event after work. Hanya Moharram is a designer based in New Jersey, with roots all over the New York tri-state area.